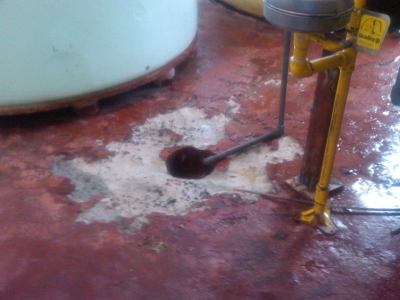 Sulfuric Acid Damage to Concrete Floor | Blackwell's Inc.
Sulfuric acid damage to a concrete floor. While coated flooring often requires less maintenance than other type finishes, cleaning and removal of any chemical spills must be performed. Chemical spills should be neutralized, washed down with water, and removed as soon as possible. This is typically achieved by using a squeegee to remove the excess to a drain and/or trench to be disposed of by the plants waste treatment process. Good housekeeping practices and regular spill removal will prolong the service life of the coated floor. We repaired this floor by first neutralizing for pH, then squaring up and cutting out the damaged section. The area was then rebuilt with vinyl ester grout and ground to the original slope. The final step was to coat with acid resistant vinyl ester.